We offer a 5 year limited warranty on the hulls of our canoes, kayaks and stand up paddleboards. This warranty covers cracking, tearing, puncture and wear through that occurs in normal use. We also offer a 1 year warranty on all parts which covers manufacturer’s defect. The warranty does not cover damage due to abuse, misuse and mishandling. All warranty work is carried out at our factory. 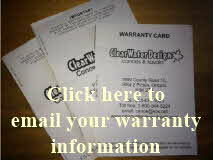 The customer is responsible for shipping warranty items to and from our location. At this time, our online registration is under construction. Please register your warranty using the email link below. Thank you.